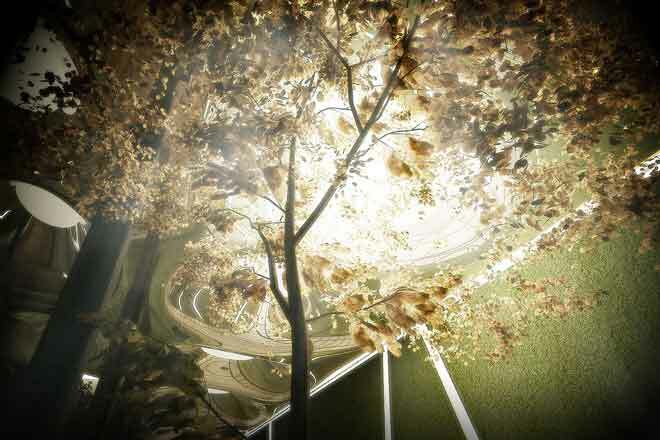 We want to transform an abandoned trolley terminal on the Lower East Side of Manhattan into the world’s first underground park, called Lowline. This space is quite large, by New York standards: 60,000 square feet, or 1.5 acres. It was built in 1903 as a trolley terminal, for streetcars traveling over the Williamsburg Bridge, and has been out of operation since 1948. We fell in love with the site because of its architectural details: old cobblestones, crisscrossing rail tracks, vaulted 20-foot ceilings, and strong steel columns. To build this park, we’re planning to use a cutting-edge version of existing technology– which we’ve already built in prototype. It uses a system of optics to gather sunlight, concentrate it, and reflect it below ground, where it is dispersed by a solar distributor dish embedded in the ceiling. The light irrigated underground will carry the necessary wavelengths to support photosynthesis– meaning we can grow plants, trees, and grasses underground. The cables block harmful UV rays that cause sunburn, so you can leave the SPF-45 at home. Sunglasses optional (for cool kids). We think a year-round public space will be valuable for everyone. Farmers markets and vendor stands can feature fresh produce and locally made goods, supporting local and sustainable businesses. Art installations, concerts, and performances can help showcase the incredible creative spirit of the Lower East Side. Youth programming and educational opportunities can offer rich experiences for kids and parents. And a safe haven from the hectic feel of Delancey Street will serve as relief in a very car-centric corner of Manhattan. When it’s really cold, or pouring rain, how much fun is it to hang out in Central Park? The High Line? Not so much. 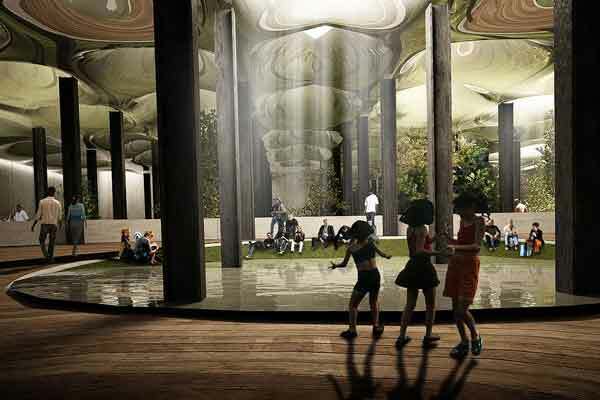 The LowLine can be the 21st century answer to traditional parks: instead of building up, let’s build down!